My visit to Yamagata City Daiichi Elementary School was unique in that it was arranged by someone who does not work at the school. Mr. Masamitsu Takahashi, a graduate of the school who works at Matsushita Electric, has two daughters, in first and third grades, who now attend the school. Mr. Takahashi does the web site for the school and coordinates the activities of Eikoukai, the group of alumni who graduated from the school in 1976. He coordinated my visit, took a vacation day to accompany me to the school, and later showed me a few interesting sites in and around Yamagata City. When I arrived at the school, the Vice Principal presented me with a 100-page children's book that tells the story of the Blue-eyed Dolls in Yamagata, with special emphasis on the story of Mary, the doll received by the school in 1927. As I took a tour of the school building built in 1927, I was impressed at how huge it is in comparison to the number of students. The school now has about 200 students, but in the past it had as many as 1,000. 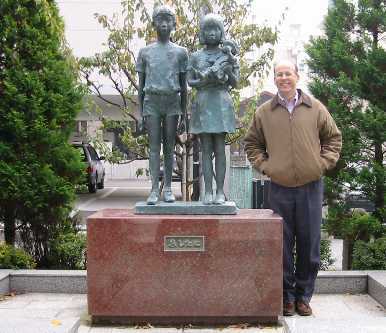 During the tour of the school, I went outside to see "Toward Tomorrow," a bronze statue based on the theme of the Blue-eyed Dolls. 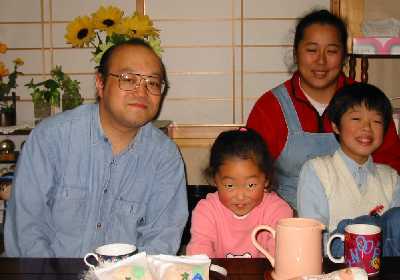 A boy and girl are standing together, with a girl holding a Blue-eyed Doll. This statue was dedicated in 1989 to celebrate the 100-year anniversary of the school. Its purpose is to show children the importance of peace. I visited the sixth-grade class as a special guest. In the first half of the class, the teacher showed a video of the play that the class had performed at a school assembly on November 2, less than one week before my visit. The play showed what it was like to live during World War II, and it contained some parts about the Blue-eyed Dolls. For example, the students acted out a scene where Ms. Yamagawa, a kind third-grade teacher during the war, teaches her students that the "a" in America is the same as the "a" in okaasan ("mother" in Japanese). The incident occurred in a time of strong anti-American sentiment in Japan. At the end of the program, all the children and teachers in the school did a beautiful performance of the Hanagasa dance (i.e., traditional Japanese dance with flower-adorned hats). In the second half of the class, I gave a brief presentation and answered the students' questions about the Friendship Dolls. The students had prepared written questions before I arrived, and I was surprised to see many students taking notes on my answers. Mr. Takahashi passed out a one-page chronology of the history of the school's two dolls, Mary (original doll received in 1927) and Eileen (new doll received in 1990 from Mr. Gulick, 3d). He also helped answer some of the students' detailed questions about the dolls of Yamagata Prefecture. 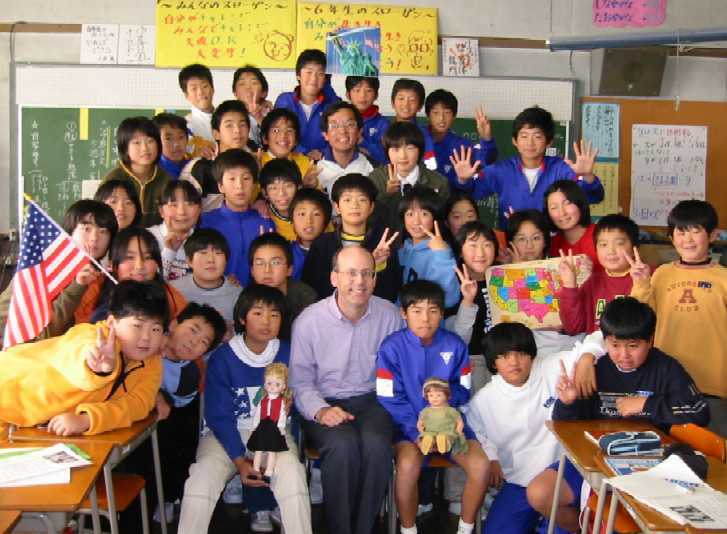 The students enjoyed the photos I gave them of Miss Yamagata, the Friendship Doll given to America by Japan in 1927 and now kept at the Maine State Museum. In Japan during the war most of the Blue-eyed Dolls were destroyed as "enemy spies," so the students wondered whether the US had the same type of attitude toward the Japanese Friendship Dolls. The students were interested to find out that most of the dolls had been originally distributed to museums, which simply stored the dolls before or during World War II and then forgot about them in storage for many years. With all of the day's activities, Yamagata City Daiichi Elementary School showed me that it has a long history of actively supporting the ideals of friendship and peace represented by the Blue-eyed Dolls.